Home health virtual visits, wound care, rural health, dermatology, skilled nursing facility care, emergency triage, specialist consults and many other clinical scenarios can easily be managed with live high-resolution video and photos delivered to a Web browser. Medical providers can minimize readmissions and maximize reimbursement with simple follow-up care and health status monitoring that does not require patients to travel to medical facilities. Click on the images to the right to download information describing results of using the telmedx platform. 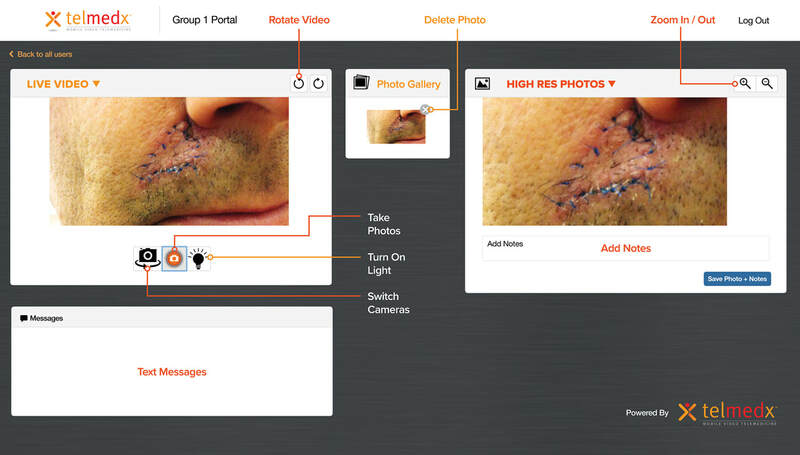 Initial patient assessments can easily be viewed on a Web browser anywhere with live video and remotely-captured still photos from the Hi-res cameras of mobile phones. Home health nurses use the telmedx platform on visits to patients' homes or to skilled nursing facilities to remotely manage conditions with doctors and nurses at a hospital. Avoiding unnecessary facility visits, hospital readmissions or trips to Emergency Rooms result in significant cost savings for medical providers. Seeing a skin condition remotely is a perfect fit for the telmedx platform. On a Web browser anywhere, a dermatologist can easily view and stay current on a patient's progress and condition. Triage call centers can seamlessly add live video to ongoing audio calls, allowing for closer analysis for accurate referrals for medical care. Unnecessary Emergency Room visits can be avoided and more efficient use of resources can be achieved. Parents of young children can have immediate access to healthcare with telmedx, providing a valuable tool and a unique service to patient subscribers in your healthcare network. Concussions, joint injuries and cuts and bruises can be remotely assessed with the telmedx platform. Live video and still photos can easily be added to an audio call with a team doctor in another location. Doctors and nurses in Emergency Rooms can provide medical direction to paramedics and EMTs at the point of contact with a patient and during transport to a medical facility. Discharged surgery patients can be remotely monitored with telmedx to manage the healing process for wounds, diabetic ulcers, eye injuries or other conditions. Emotional conversations require high quality audio, and telmedx is the only mobile video platform to provide reliable, high quality audio and simultaneous live video and high-resolution photos that can be added to an ongoing voice call. Nurses at walk-in clinics can connect to doctors in another location for remote consultations. Patients can also be remotely examined from home in cases where traveling to a clinic is not feasible. Specialists in different locations can also be easily connected for a group consult. Drug compliance and protocol compliance can easily be monitored and managed remotely from a Web browser with the telmedx platform. In many clinical trials, reactions to drugs or certain protocols require in-person examinations, but it can be difficult for a doctor to determine if that examination is necessary in the first place. With telmedx, time and travel can be saved with a quick remote assessment of a patient's or trial subject's condition.